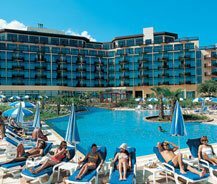 Merit Crystal Cove Hotel is a well known five star hotel around Kyrenia. This has a private beach for their guests and it is surrounded by Mediterranean Sea and Besparmak Mountains. This provides the visitors a most attractive and charming scenery to look around with peace. This also looks greenish as it is surrounded by 32 acres of landscaped gardens. Other than these locations the hotel comprise of nearly 300 rooms in that 127 queen rooms, 77 twin rooms, 24 junior suites, and 2 royal king suites all with a balcony which enables the guests to have a sea view from their rooms. All the rooms in this Five Star hotel provides facilities such as central air conditioning, private bath, shower, hair dryer, satellite TV, pay TV, safety box, mini bar, business accessories and fire alarm systems which all five star hotels must contain. Other services available in this hotel are scheduled shuttle trip to and from their private beach at frequent intervals, swimming pool with sections especially for children, water sports such as jet-ski depending on their season, canoes, diving, tennis, beach volleyball and basket ball. Restaurants are also available in more number each restaurant specialized in each category. This hotel is situated just at a distance of 10 kms from the harbor town Girne and hence it is easier to reach from harbor.